My twitter feed is currently crawling with disgruntled passengers complaining about flight cancellations. With Ryanair cancelling 20,000 flights due to rostering issues, British Airways removing free seat choices and in flight food, and the collapse of Monarch and Airberlin, things do not look good for the European airline industry. But, who do you vote for in the competition of the ‘Worst European airlines’? We asked some fellow travel bloggers to share their experiences with some of the worst airlines in Europe and here are their stories. On our recent flight to France, we flew with KLM. Whilst the flight itself and the staff on board the flight were great, the experience we had when things went wrong was very painful. On the trip to France, we had a delayed bag. Funnily enough the bag arrived in Paris the next morning, but nobody could be bothered delivering it. After 4 days of waiting, begging and arguing, we decided to fetch it ourselves (the bag was only a 40 min drive away from our apartment!). But wait, it doesn’t end there. On the way home, we missed our connection flight due to a delayed flight. We had an 8 hour transit wait, and they booked us on to a budget flight. You had to pre-book meals on this budget flight and KLM did not book them for us. It was a long haul overnight flight and we had a 14 month old baby with us – and no food! We found staff to be incredibly unhelpful and we will never fly with KLM again. Anne: oh wow, I can understand why you would be upset with that experience. You would think there would be some sort of laws against this type of inhumane behaviour. Ryanair has to be the worst European Airline ever. Their airports are dedicated to low-cost airlines so they are overcrowded, uncomfortable, and have limited entertainment. They are also usually in the middle of nowhere, so you have to pay for an expensive bus to get to where you wanted to go. There are no seat pockets on the plane so you can’t put your belongings anywhere, and you are usually surrounded by annoying stag or hen parties. Drunk before boarding the plane, they yell across the plane to communicate with each other, ruining your peace. Last time I travelled with Ryanair, I was lucky that my trip was not cancelled, but was shocked by how non-transparent Ryanair has become. I chose a €77 round trip and ended up paying €162. Baggage of 15 kg cost me €35 (compared to 15 not so long ago), I wanted to choose a seat next to my friend, and had to pay extra again and they even charge you for the web check-in if you do it more than 4 days before the trip. Not to mention the regular stuff: low-cost service, no leg room, etc. I won’t be flying Ryanair again for sure! Anne: I love how this airline charges you to check in online, but actually does not offer you the option to check in at the airport. Not only do we get to do the job of the airline, but we also have to pay for the privilege. Ryanair definitely wins my vote for worst European airline. I like to keep a positive outlook and try to find a silver lining, however, after having our flights cancelled, changed and delayed on more than one occasion, I have serious reservations about the Italian airline Volotea. My husband has declared that he will never again fly with this company. Our first attempt to travel with them took place in October 2016. We had booked flights to Croatia and were informed a month beforehand that our flights had been cancelled for ‘operational reasons’. Fast forward to February 2017 and I foolishly decided to give them another go. I booked another set of flights to Croatia for the autumn and yet again, our flights were cancelled 3 months beforehand (woo-hoo they gave us 3 months’ notice this time). We then booked flights to Portugal but were informed that the return flight times had changed – not by an hour or two, but by a whole 4 days! School and work commitments meant that yet again, we had to cancel our flights. I’m obviously the eternal optimist, as I had another go and booked flights to Madrid. They actually went ahead, but not without significant delay on both the outgoing and return flight. We’re due to fly to Portugal with them later this month – we must be gluttons for punishment. Wish us luck! Anne: Crikey, I definitely think this sounds like the most unreliable airline EVER. I have never heard of them and am now in no rush to make their acquaintance. 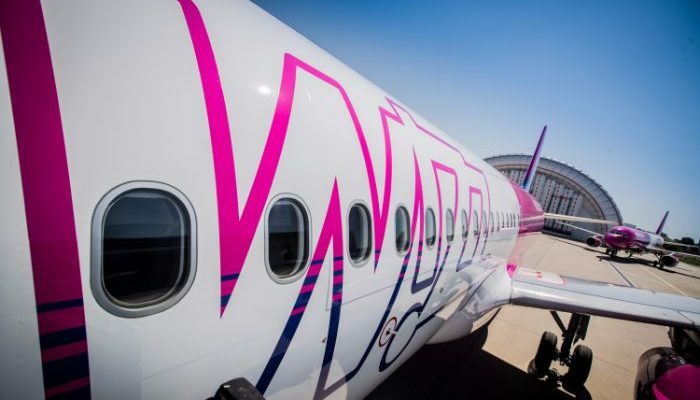 Wizzair, the Hungarian low cost airline dominates Eastern Europe. The airline offers basic services for low fare prices, but they charge extra for everything, and their fees are much higher than those of Ryanair or EasyJet. They only allow travellers to bring a small backpack onto the plane for free. Most of their flights are delayed by at least an hour. Their app is faulty, and passengers often find themselves unable to download their boarding passes at the airport, when trying to check in. In this case, Wizzair charges them €40 for printing a pass. The Hungarian Bureau of Consumer Protection received the most complaints about WizzAir of all the Hungarian companies in 2016. They never refund customers for anything, even if they admit that the problem was their fault. One passenger received an email from the airline to say that her flight was rescheduled, and advising her that she could take a later flight or receive a refund. The customer opted for a refund, which she never received. On another occasion, a customer reserved a seat, the reservation never went through, but his credit card was charged. He complained, but never received a refund. We fly with low cost companies a lot, especially to move around Europe, and are used to massive delays, hidden taxes and fees. We complain a bit but people say you get what you pay for. There are some things that shouldn’t be low cost though, and one such thing is onboard customer service. The good thing is that while some airlines don’t know how to treat their clients, there is always plenty of competition to fly with! Anne: You may also wish to read my review of Wizzair. In contrast, I have had only positive experiences on each of my six flights with the airline. I accept that budget fares can be harder to come by, but the airline flies to mainstream airports and the planes are usually full. Which airline is officially worst? Interestingly, in our small sample Easyjet does not feature at all and yet they topped the list of airlines for whom EU Claim received compensation requests. Ryanair came in second in their data and even British Airways featured. To be fair, I’ve had my own share of pain with them when they cancelled my Qatar flights with just an impersonal text and email. Still I did manage to get a trip into Croatia and Montenegro as a result so it is not all bad. What to do if you are impacted by delays and other issues? You can contact a specialist agent who will help you claim compensation against the airline. One such company that I reviewed was EUClaim. Find out how to secure your flight delay compensation with them, and sign up for their blog as they will keep you updated with useful information about changes to passenger rights. Who do you think steals the crown for the worst airline in Europe? Now, over to you. Feel free to share your own stories of airline horror, and if you like this post, please share it! I’d love to know who you and your friends believe should own the crown of worst airline in Europe? Unfortunately, I’m not surprised to read these since I’ve heard similar horror stories from my friends. I’ve only flown KLM from the states and have never had a problem with them. I think I would stay away from the other airlines. Of these I’ve only used Ryan Air. Well, not actually. Our flights were cancelled due to an air controllers strike. They did put us up in a hotel overnight. And when the flights were cancelled again they refunded us our money! Wow, these are some serious horror stories. I think RyanAir and Wizz Air take the cake. I can’t believe they would offer a refund and not give it. How do these companies stay in business with all these complaints? I’m glad that travel bloggers like you are bringing these problems to the surface. I now have a mental note of these airline names and will think twice when given an option to book with them. I guess they will only decide to change their service when people stop using them. I have to say, out of these experiences I think the experience with Volotea would get my vote for worst experience. FOUR DAY DELAY? That’s unheard of! I don’t get too upset about the baggage fees because I know that going into booking those flights and try to take as little as possible. However, the fee for checking into your flight?! That’s insane. Hands down, Ryanair is the absolute worse. I’ll hitchhike across the continent before I get on another one of their planes or give them another cent!! I love easyJet. RyanAir has to be the worst for me. The fact that they charge a ridiculous amount just for not printing your ticket is absurd. I used to avoid them at all costs when I lived in Europe. Funny – when I read the title I instantly thought of KLM. Sure enough, they were the first mentioned in the list! I had my luggage lost while flying with them 2 x. Never again! I have never found them bad but it is surprising how many people say the same about them. I am surprised to see KLM is on that list. But then one tends to remember nightmares than good dreams. The first time I had taken KLM was when I flew to Switzerland.. The baggage was delayed but the very next day it was delivered to us at our hotel. This was quite some years back. Yep when I have bags get delayed places, I usually find the airlines are very good at getting them delivered to you the following day. My only exception being once in Russia for NY, when it was absolutely freezing, and the bags arrived the day we were due to leave. It pretty much ruined our NYE as we had nothing to wear and none of the shops were open. Not the best start! I have to say I’ve never had an issue with KLM and have always enjoyed the service the company provides. I’ve also had pretty great experiences on Wizz Air and I’ve never had a flight delayed by the company…ever. I will agree that I don’t really enjoy EasyJet…but it’s mostly been mediocre at best. You get what you pay for in most instances. It’s hard to say which airline is the worst. They all seem to have their ups and downs. Turkish Airlines claimed to be the best in Europe, but my experience with them was so bad that I lodged a claim which they paid 4 months later! I can’t image being on an overnight flight and not being provided any food! Surely they could have figured something out! I think I cast my vote for KLM being the worst airline. That’s mind boggling! Definitely shocking, especially with a baby! I’ve heard horror stories about Ryanair but was surprised to see KLM on this list. In the US Spirit uggs horrible. I Agree. Travel is fraught with difficulties. Technical problems, weather, strikes, people and a whole raft of other things. Individuals can have very different experiences with airlines as my experience and Barbara’s shows. That said there are persistent offenders and I was surprised Ryanair did not feature more. I cannot stand them but am a glutton for a bargain and am heading off to Slovakia with my father next year on them. So I started to read this thinking…First World Problems…geez arent we a bunch of travel snobs. But as I read about the Volotea Gillian and those crazy Delays! Dang! 4 day delay would have totally made me lose my marbles if I had other obligations! Plus those compaints with Wizz Air sound harsh. I guess living in the US and only having 2 airlines really offering those bargain flights, I dont have much expectations for when I do fly a bargain flight thus I am usually content. But if I had to drive to get my bags or figure out accomadations for another 4 days I would be upset too! Eric those are good points you make. At least in the EU, we have some protection in the event of these situations. I remember having to sleep on the floor of Washington DC airport due to cancelled flights and the airline was completely unsympathetic. At least when planes have been delayed in the Uk, I have been put up in a nice hotel. I guess that travelling can be stressful though, and our patience levels wear thin in confined spaces with screaming babies, a lack of leg space, and long queues for the toilets lol. Yikes, hahaha! I had no problem with these airlines so far luckily, but I did have a really bad encounter with the Wow Air customer service over the phone the other day. Let’s hope some of these guys read your article, haha!